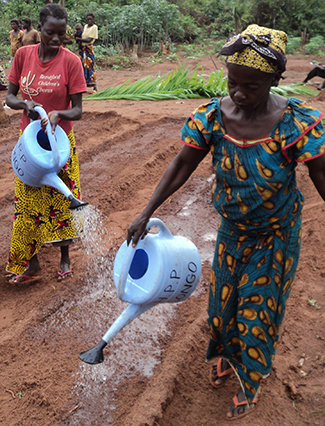 One of the keys to our cooperation projects is its appropriation by the communities involved so that the results are sustainable and durable; thus the project is developed in Gemena, Democratic Republic of the Congo, with the help of HPP-Congo and funded by AECID. Although he has already spent one year from the completion of the project "Improvement of the organization and production capabilities 3,000 small farmers in Gemena, Equateur Province. R. D. Congo", positive results continue to occur. The aim is that the impact of the actions to be sustainable over time. It is therefore essential that the communities involved take ownership of the initiatives undertaken. The Paris Declaration (PD) on Aid Effectiveness to Development includes among its principles "the appropriation of the implementation of aid by recipient countries: the developing countries exercise effective leadership over their development policies and strategies development, and coordinate development actions". To achieve this it is necessary to have a space for the participation of all concerned. Since the completion of the project, farmers have formed small organizations that allow them to work in groups, which facilitates the maintenance of small built infrastructure such as rope pump wells, for example. The project was based around the creation of 60 Farmers Clubs 50 members each, supported by a team of instructors. 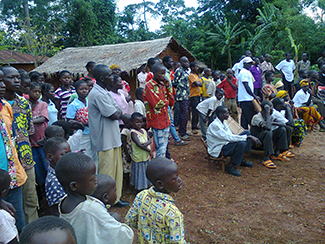 The active participation of local leaders has also led to improved results through community mobilization. Another key element is the empowerment of women participants. When the project began, most do not even dare to express their views. Now, begin to develop important work to generate income for their families. The opinion is unanimous among all farmers: agricultural training received and implemented new techniques have resulted in improved production. Thus, it has achieved 75% increase in cereal production, nearly 200% of legumes and multiplied by 10 the vegetables. Incorporating row planting, fencing of plots to protect animal or crop rotation are key in this regard. As a result, the income that families are able to generate increased considerably, as evidenced by the fact that we now have the resources to bring to school their children is not a burden. In addition, the progress of the community observed since the beginning of the project has been supported by other key actions such as literacy classes that have allowed some people who previously could not read or write, capable of accounting for your small business agricultural. Awareness raising on environmental protection, sanitation and hygiene have also been critical. Now, the community assumes that the natural environment is a common good and wood burning indiscriminately impoverishes the soil and is environmentally irresponsible.